The new year began with a bang but not in a good way. It was not the sound of a party, celebration, or joy. It was, rather, the sound of death, anger, and violence. 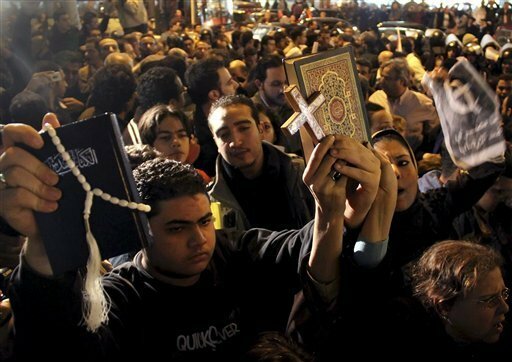 On New Year’s Eve Coptic Christians gathered to celebrate the Eucharist at a church in Alexandria, Egypt. As the liturgy was ending, in the early hours of New Year’s Day, the church was bombed killing 25 people and wounding at least 80 others. It is another one of those headlines that can challenge our worldview, making us wonder what kind of world we live in. Is the universe for us? Is the universe against us? Or is it just neutral? For people of faith those are not just questions about the universe or a worldview; they are questions about God. Those questions are not limited to just the events of headline news. They hit pretty close to home too. Look at the painful places of your life and you will see the place of an explosion. You know those places, right? One day life is on track and the next day it is unrecognizable, everything has changed. We stand there looking at our world unable to believe what happened. We could each name the explosions our lives have sustained. Sometimes we talk about them but other times we keep them buried deep within our heart. Either way the memories can trigger fear, anxiety, and tears. The explosions of life leave us in shock, wounded, and confused. They rock not only the world around us but the world within us leaving us to wonder, ask questions about, or even doubt whose side God is on. These explosions become even more lethal when they are combined with some really bad teaching. Too many people have been told and bought in to the idea that Christianity is mostly about being good, that human nature is nothing but bad and sinful, and that our guilt killed Jesus, the Son of God, an innocent man. If that is true surely God is not on our side, never was, and never will be. That combination kills not only body and soul but also the spirit of faith, hope, and love. The best, it seems, we can hope for is that God is at least neutral, overhead somewhere at a safe distance, perhaps watching and listening. Either way we have been abandoned, left alone and defenseless. Under one scenario we live in fear and anxiety always trying to appease an unappeasable God. In the other scenario our prayers simply become pleas that an indifferent God would show up and be with us or those we care about. That is not the life God gives us. That is not the life God desires for us. In the baptism of Jesus God has chosen sides. God has chosen us, picked us, sided with us. God did so with full knowledge of all that we are and all that we are not, all that we have done and all that we have left undone. The baptism of Jesus is more about God’s solidarity with us than it is our sinfulness. God is always choosing to be on the side of humanity. It was a choice God made at our creation. The choice became clear, visible, and physical with the birth of Jesus. Today God in Jesus chooses to stand with, among, and as one of us. God chooses to be for us. It is a matter of righteousness. How could the God who is righteousness make any other choice? As Jesus came up from the water the heavens opened, the Spirit of God descended like a dove, and a voice proclaimed, “This is my Son, the Beloved, with whom I am well pleased.” That is the Father’s recognition and acknowledgement that all righteousness has been fulfilled. That righteousness is the joining together of earth to heaven and heaven to earth. It is the joining together of divinity and humanity. It is the joining together of the created and the Creator. It is the affirmation that in Jesus God stands in solidarity with all humanity. In baptism one life is immersed so deeply into another that they now stand as one. They live as one. They die as one. And they rise again as one. Jesus was baptized into the life of humanity and the created so that we might be baptized into the life of divinity and the Creator. That does not mean that life is no longer difficult or that explosions will never occur again. They will. There will be more explosions in our world, in your life, and in mine. It means, rather, that when the explosions happen we can trust that God is on our side, present, standing with us, as one of us, among the rubble. It means that we can trust that God is for us and that God will offer a way forward. God always does. For the Christians of Egypt that way forward came in a very unexpected way and from people they could not have imagined. Muslims. This past Thursday night, while we were celebrating the Feast of the Epiphany, Coptic Christians, using a slightly different liturgical calendar, were celebrating Christmas. Thousands of Muslims attended Christmas liturgies on Thursday and Friday alongside Christians. Others gathered outside churches acting as “human shields.” That was an act of baptism. They immersed their lives so deeply into the lives of others that whether they lived or they died they did so in solidarity. They did for other human beings what Jesus did for all humanity. I cannot help but believe that righteousness was fulfilled, the heavens opened, the Spirit descended, and God was pleased with his children. The solidarity enacted at Jesus’ baptism is the foundation for human solidarity that crosses boundaries of race, nationality, economics, and religions. It is the foundation from which the fractures in the human heart will be healed. Every one of us is called to live a life of solidarity, with God and each other. We can do that only because God did it first. It is the only way we will ever survive the explosions of life, the only way we can ever form new relationships and reconcile old ones, the only way in which righteousness will continue to be fulfilled. Thank you, Michael, for again calling us to a new look – a new perspective, especially about those we would call “enemies.” I appreciate hearing you invite us to look at and know that our Loving God is One who loves all of God’s Children – and that some Muslims are speaking up (or standing up) in a valuing of us ALL. I know that God loves them just as much as God loves me/us. I SO PRAY that people will come to a place of acknowledging that hatred, hateful rhetoric, and grouping all of any group of people in a stereotype grieves God and is just WRONG.